We have a four-node IIS HyperV cluster that holds our websites. At the moment we have a monitor on for website availability setup in SCOM and setup a dashboard for all the websites and this works fine. We would now like to monitor all parts of the website setup including IIS and any relevant SQL servers. An example would be on the same window to monitor the IIS instance, the IIS server, the SQL server and the website availability. Is it possible to set this up via VADA? if not is there a way to show the current IIS node the website is hosting on? For now, VADA only works with server objects (linux/windows). 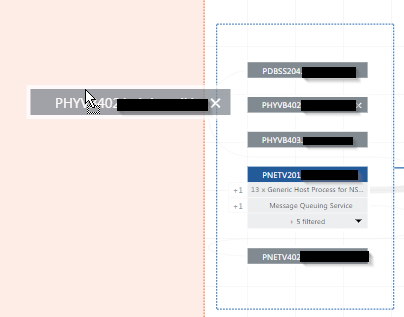 You can manually add servers to a topology and connect the dots yourself. Simply start with the IIS server hosting the website. Go to app discovery. Below the server you mapped out you should see a small +. Which will allow you to manually add a server. Simply search for the servers you want to add. You can then drag them away from that group of servers to create a ‘Hyper-V’ group for example. You can then add a dependency between the servers if you like by clicking the + sign next to the group. Hopefully that helps. As a general advice I would always recommend to start from the front end to the back end to create your VADA topologies. Thanks Jasper that makes some sense. With regard to the other question about whether you can show the current node that a Web Instance is hosted on? Is this possible as I cant see a way to do it. Do you mean which hyper-v host it is hosted on? Because you can see this when you click the analyze button on the top right. With showing the node the website is on, I don’t think there is an easy way. But you could possibly do a task that you could run on demand that will return the active node? Not very pretty I know. Squared Up just released a PowerShell MP - https://squaredup.com/free-powershell-management-pack/ - Perhaps this is the solution you are after? Yeah the PS MP would work. It's a fantastic add-on. We are loving it and using it to grab metrics from stuff we couldn't before.